Martwayne | Power Through Fashion: FADAN Talent Hunt 5 - Entry Closes 12 November 2012! FADAN Talent Hunt 5 - Entry Closes 12 November 2012! So I attended the Press Conference for the FADAN Talent Hunt 5. For those who have not heard about the Talent Hunt before, the Fashion Designers Association of Nigeria (FADAN) organizes a competition to encourage and support young fashion designers. I recall the one I attended in 2010 at The Civic Center and I must say, what the finalists churned out was very impressive. But before then, what needs to be done? Easy! - "Nobelafrik Int"; Account No: 6010194196, Zenith Bank. 3. Send an sms with your name and phone numbers to 0802 311 9874 to receive details of the audition venue. 4. Create 3 storyboards with a casualwear, an officewear and an eveningwear look, complete with detailed technical drawings. Ok... for those who have no clue what I'm talking about, this simply means: draw 3 sketches, a casualwear, an officewear and an eveningwear look, complete with detailed information on how you plan to produce them. Sketches can be submitted on a sketchpad, but in my opinion, fah-bu-lous storyboards will be great. Remember though that the competition is more about your technical ability than your artistic skills. 5. Submit the form, deposit slip and sketches at the audition venue on the date that will be communicated to you in due course. Simple right?! I thought so too! NOTE that the deadline for registration is 12 November 2012. SO what do you stand to gain? A whole lot if you ask me! The winner gets a N200,000 cash prize, Enterprise Development Training at W-Holistic Business Solutions and a 3-month scholarship at a fashion school in Nigeria. Other finalists also get prizes as well so everyone is a winner really. And for FADAN members who want to take advantage of the event to also promote their goods and services, you can either participate in the exhibition or advertise in the Talent Hunt event programme. The exhibition will hold from 9am to 4pm on 23rd November 2012, and stands cost N20,000 while adverts in the programme will cost N50,000 for a full page, N25,000 for a 1/2-page ad and N15,000 for a 1/4 page advert. Interested members should make their art work available in soft copy and get in touch with Nobel before 12th of November. All art works must be submitted on a CD or DVD. Great! So get those croquis books out and start sketching. 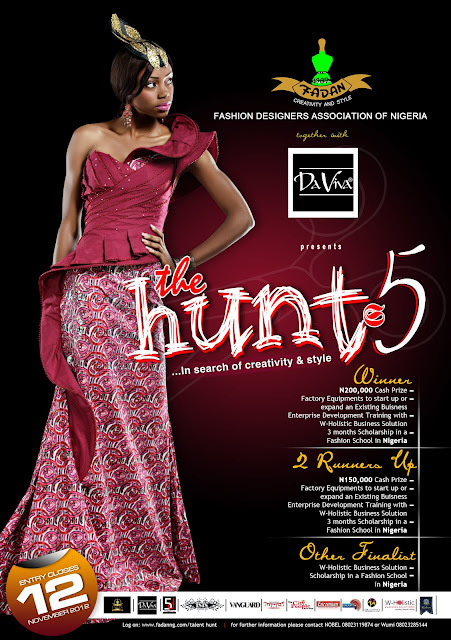 Remember that entries are open to fashion designers all over Nigeria so those outside Lagos can also benefit from this. Okies! That said! Visit www.fadanng.com for more details. All the information is there really, including a page with answers to Frequently Asked Questions. But if you have other questions, feel free to call Nobel or Wunmi on the numbers provided. And if you want to see pictures of the previous winners and their work, it is also on the site. Excellent! Here's looking forward to seeing your designs at the next FADAN event... though I'm not sure I'll be in town then. BUT I will see the work on the site and keep my fingers crossed for all the entrants. Great! Enjoy your week people!! !